I am always trying to get more greens into my day. Last nights side dish was all from my garden. 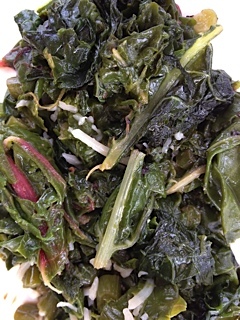 Ingredients: swiss chard, spinach, kale and garlic scape. First heat up the pan with a little olive oil, add the garlic scape, cook for 3 minutes, then add the swiss chard, spinach, kale, and water, put the lid on. Continue to add water to the pan as needed, takes about 10 to 15 minutes to cook. Plate the greens and add a sprinkle of parmesan cheese. Enjoy. This entry was posted in Food, Recipes, Uncategorized and tagged Chard, Cook, Garlic, Garlic Scape, Greens, healthy eating, Home, Kale, Leaf vegetable, Olive oil, Spinach, Vegetable. Bookmark the permalink.